The Legend of Zelda: Link's Awakening (Zelda no Densetsu: Yume o Miru Shima in Japan, lit. "The Legend of Zelda: Dreaming Island") is the fourth game in Nintendo's famous The Legend of Zelda series. It was released in Japan on June 6, 1993 and arrived in North America the following August. The game was directed by Takashi Tezuka, with supervision from Shigeru Miyamoto. In 1998, Nintendo needed a title to release alongside their latest handheld device, the Game Boy Color. 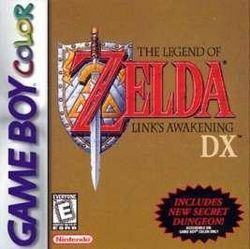 Link's Awakening was one of several titles given a colorized "DX" overhaul to help promote sales. The Legend of Zelda: Link's Awakening DX was more than a simple cash-in; it not only introduced vibrant color and fixed many of the original's glitches, it also included the brand-new Color Dungeon with puzzles centering around the use of color, as well as collectible Photographs compatible with the Game Boy Printer. This time around, Tezuka acted as project supervisor, and Yoshinori Tutiyama as director. It was released in North America on October 28, 1998, and in Japan on December 12, 1998. Link's Awakening received some criticism for abandoning the traditional setting of Hyrule, but was still a solid success. Unlike his past adventures, this time around Link washes up on a mysterious island, and is awakened by a girl who resembles Princess Zelda. The game retains the top-down perspective employed in The Legend of Zelda and A Link to the Past, as well as a number of mechanics from the latter. This page was last edited on 29 July 2016, at 14:12. This page has been accessed 87,103 times.